Get an INSTANT, FREE pricing quote! We are Ocala’s top choice for wooden deck and fence cleaning, and for wood restoration services. Have you ever seen a deck that is less than perfect shape? Regularly cleaning your deck is critical to not only keeping it looking great, but to giving it a longer life. License to Wash knows how to get your deck looking great, and to help it last. We are experienced professionals and know just what it takes to treat and protect your deck from the elements. Over time, the sun and rain take their toll on your wood surfaces, causing a grayish, unattractive hue over time. 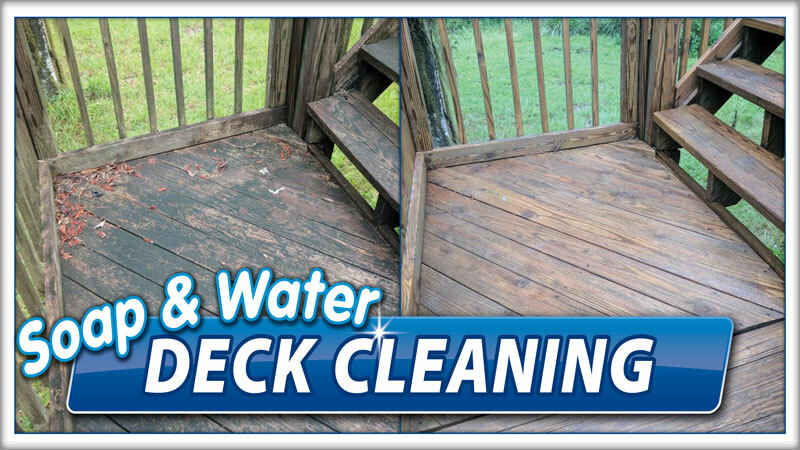 Add in algae and mold that form over time, and your deck can be a mess! It’s a constant battle with the elements, so protection of your wood is crucial to prevent cracks that can cause trips, falls, and splinters, especially for small children and pets. Not only can a deck that isn’t cared for be unsightly, bringing it back into good condition can be costly. To avoid that cost, have your deck regularly cleaned and sealed the right way. License to Wash can help!